This morning the thermometer is stuck on 31 degrees. It is pretty rare that we have such a frosty awakening in sunny California. 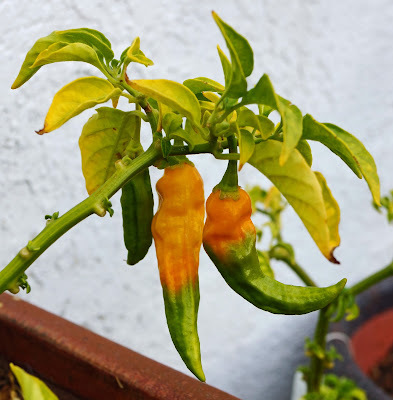 Luckily, I had the foresight to plant my Ghost peppers in a pot. This will make it easy to move my precious peppers under our covered patio to protect them from the chilly frost. While I was transporting these fiery capsicum bombs I noticed several beautiful multicolored semi-ripe peppers. What should I do to preserve them? 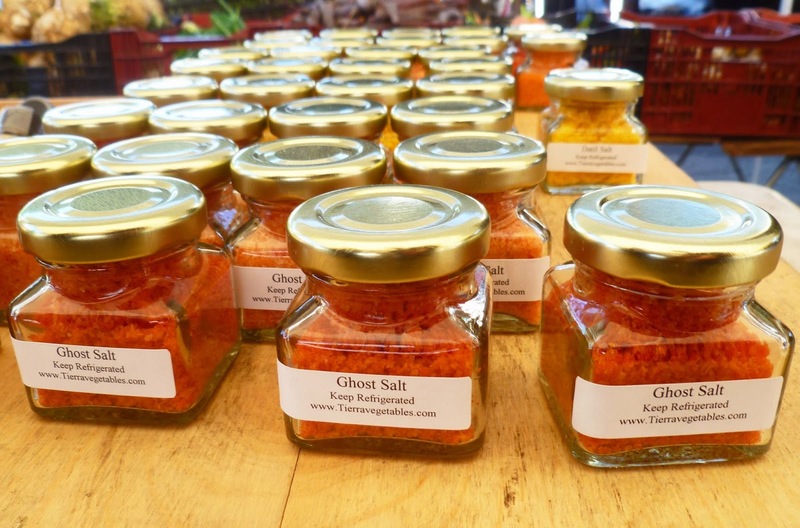 How about making some Ghost pepper salt? This idea is not original. In fact preserving things in salt has been around for a very long time even before the conception of the'World Wide Web'. My inspiration comes from Leah (*Tierra Vegetables' ) at the Ferry Plaza. Leah has taken several different breeds of peppers and pureed them. She adds the puree to kosher salt. That's it. We purchased the Ghost pepper salt. You would not believe how fresh and fragrant this salt smells. It also is very, very, very hot. 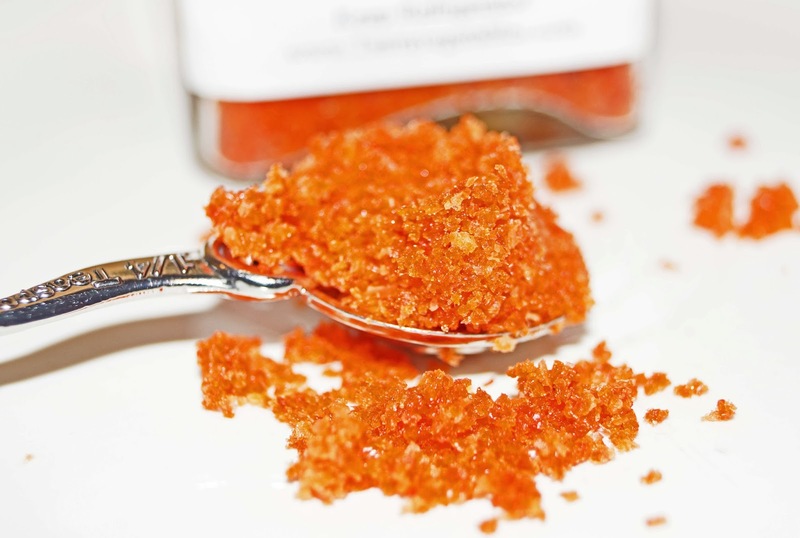 This flavored salt is not for the chile pepper challenged. This will be great used as a finishing salt or as a seasoning marinade. I can think of numerous food applications. 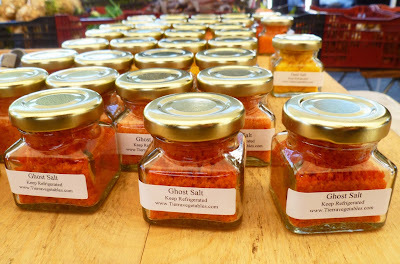 I will attempt to make some of my own Ghost pepper salt later today. But first I am going jump back under the covers because it is cold outside. Fun post! Even for those of us who are pepper-challenged. Sounds interesting. I can't wait to see the results. I have to get out more often. I did not know Tierra was at the Ferry Marketplace. We used to buy their pepper jellies at the farm stand in Windsor. Zoomie, Having fun is what is all about. Thanks. Three Dogs BBQ, I am going to use this on some chicken wings. I am sure it will put the hot in hot wings. Greg, You may remember Leah from the Marin market. That is where we met. We have been to their farm too.